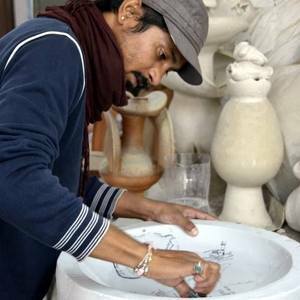 Studied Ceramics in 2005 from Lucknow University. Working from last 15 years as a freelancer. National Academy Awardee with some prestigious Residency programs in my profile helped me to put steps forward more confidentaly. My creative process involves alluring of hidden/thrown/discarded/unused, thoughts/elements which creates immense sense of beauty and aesthetics. 2011	National Academy Award, Lalit Kala Akademi, New Delhi. 2011	Best Exhibit of the year Award, 17th All India Studio Pottery Exhibition, AIFACS. 2010	Lalit Kala Research Grant, Lalit Kala Akademi, New Delhi. 2016 Artist in Residence, at President House, New Delhi. 2015	Upcycled Art Festival II, Art Hub Liwa, Abu Dhabi, UAE. 2013	Nomadic India Residency, Clayarch Gimhae Museum, Gimhae, S.Korea. 2012	‘Earth Matters’ An Indo Korean Ceramic Residency, Kalakshetra Foundation, Chennai. 2011 ‘A DISTINCT ALLEGORY’ Apparao Galleries, Chennai. 2010 ‘SCABROUS ALLURE’ Tao Art Gallery, Mumbai. 2009 ‘This Way’ at Fine Arts Faculty, M.S.University Baroda. 2015	‘Art Takes Wings’ Art Hub Liwa, Abu Dhabi, UAE. ‘Hello India’ Art 507, Seoul, S.Korea. 2014	‘New Year New India’ Gallery Jung, Seoul, S.Korea. ‘Colorful Wonderful’ YIDO Gallery, Seoul, S. Korea. 2013	Special exhibition of International Residency Artists in Korea, Ilju & Seonhwa Gallery, Seoul, S.Korea. ‘Nomadic Garden’ Clayarch Gimhae Museum, Gimhae, S.Korea. 2012	5th Beijing International Art Biennale, Beijing, P.R.China. 2008	3rd Beijing International Art Biennale, Beijing, P.R.China. ‘ART ACTION’ Malcolm De Chazal Art Gallery, Curepipe, Mauritus. 2013	‘PAUSE n PLAY’, Jehangir Art Gallery, Mumbai. 2013 ‘PARALLEL REALITY’ by Pallete Art Studio, in Devlalikar Art Gallery, Indore. 2012	‘EARTH MATTERS’ Indo Korean Ceramic Exhibition, Lalit Kala Akademi, Chennai. 2012 Group Show of Paintings & Ceramics, Lalit Kala Akademi, New Delhi. 2012	‘THE SCHOLARS SHOW’ exhibition of Lalit Kala Research Scholars, LKA, RC, Lucknow. 2010	‘EXCELLENCE IN CERAMICS’ India Habitat Centre, New Delhi. 2010 ‘FROM THE CENTER’ A group exhibition of Contemporary Indian Ceramists, Gallery Art & Soul, Mumbai. 2009	Group show of Paintings & Ceramic Sculptures, Chemould Art Gallery, Kolkata. 2009 ‘ABHIVYAKTI VII’ All India exhibition of Art, State Lalit Kala Akademi, Lucknow. 2008	‘ART n SOUL’ Gallery ACCRETE, Udaipur, Rajasthan. ‘DIFFERENT STROKES’ Mystiq art Gallery, New Delhi. 2007 ‘DUO’ An exhibition of Paintings & Ceramic sculptures, New Delhi. 2007 ‘TIME & SPACE’ A Group Exhibition of Paintings & Ceramics at State Lalit Kala Academy, Lucknow. 2007 ‘TIME & SPACE’ A Group Exhibition of Paintings & Ceramics at Birla Academy of Art & Culture, Kolkata. 2005 ‘ABHIVYAKTI II’ A Group Exhibition of Young Artists, at Regional Centre, Lalit kala Akademi,Lucknow. 2011	53rd National Exhibition of Art, Lalit Kala Akademi, New Delhi. 2011 119th Annual All India Art Exhibition of Bombay Art Society, Jehangir Art Gallery, Mumbai. 2011 17th All India Studio Pottery Exhibition, AIFACS, New Delhi. 2007	11TH All India Art Exhibition of State Lalit Kala Akademi, Lucknow. 2006	15th All India exhibition of Studio Pottery organized by AIFACS New Delhi. 2006 72nd Annual All India Art Exhibition of Indian Academy of Fine Arts, Amritsar, Punjab. 2006 26th Annual State Exhibition of State Lalit Kala Academy, Lucknow. 2005 20TH All India Art Exhibition of SCZCC, Nagpur . 2005	19TH All India Art Exhibition of SCZCC, Nagpur. 2004 Regional Art Exhibition of State Lalit Kala Academy, Lucknow. 2003	‘KALARTH’ Exhibition, College of Arts * Craft. Lucknow. 2001	II Painting & Sculpture Group Exhibition at College of Arts & Craft, Lucknow.